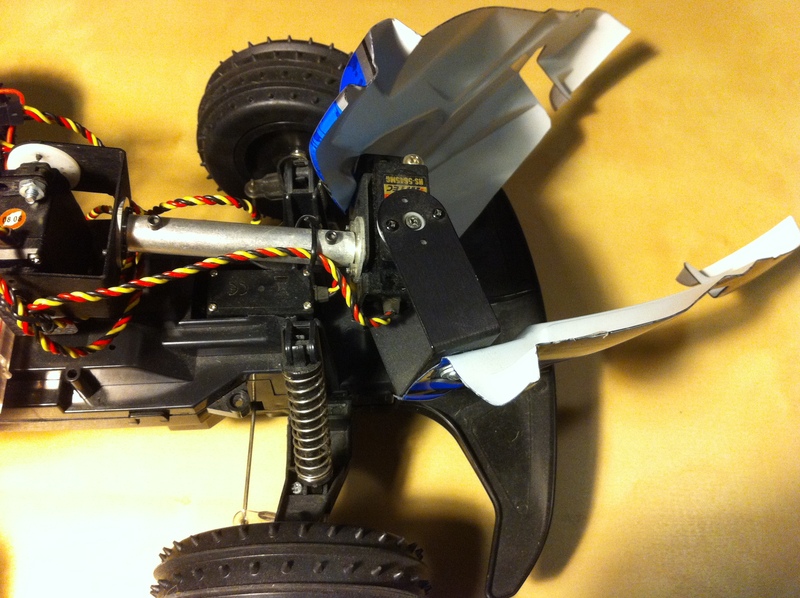 This is an RC car with a robotic arm. 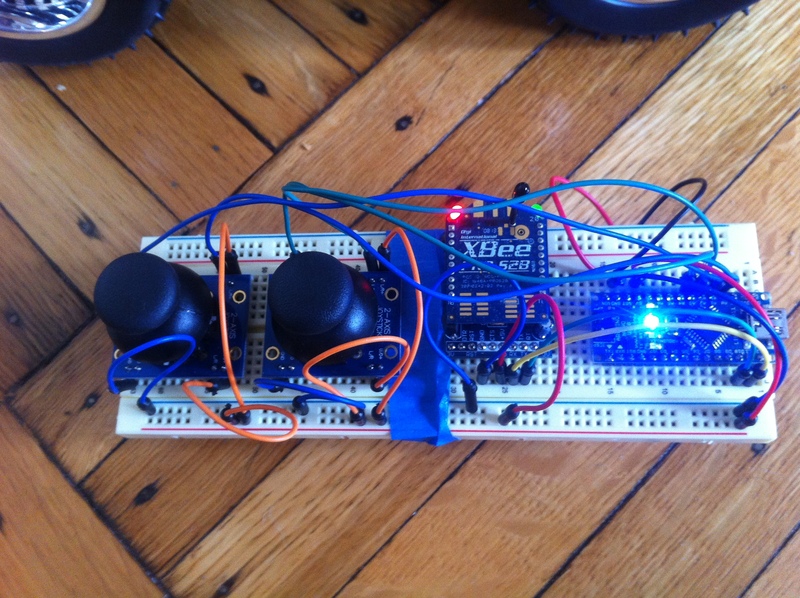 Everything is being controlled by an Arduino that is receiving commands from a quick prototype of a wireless remote. All the commands from the remote are transmitted using 2 XBee modules(one on the car, one on the remote) as the wireless serial link. 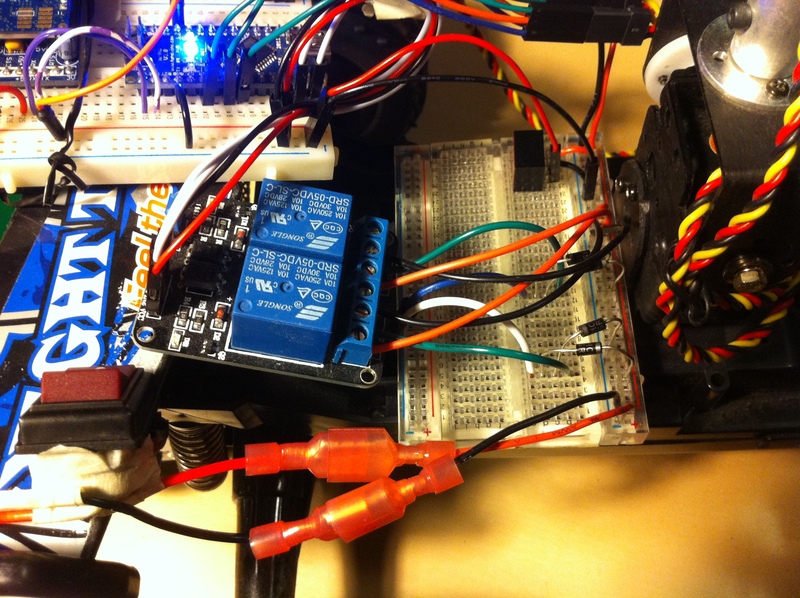 The Arduino directly controls one servo for the steering and 2 servos for the arm and claw which can pick up things. It does this using a timer on the AVR chip to generate pulses of the correct width on each servo’s signal wire. 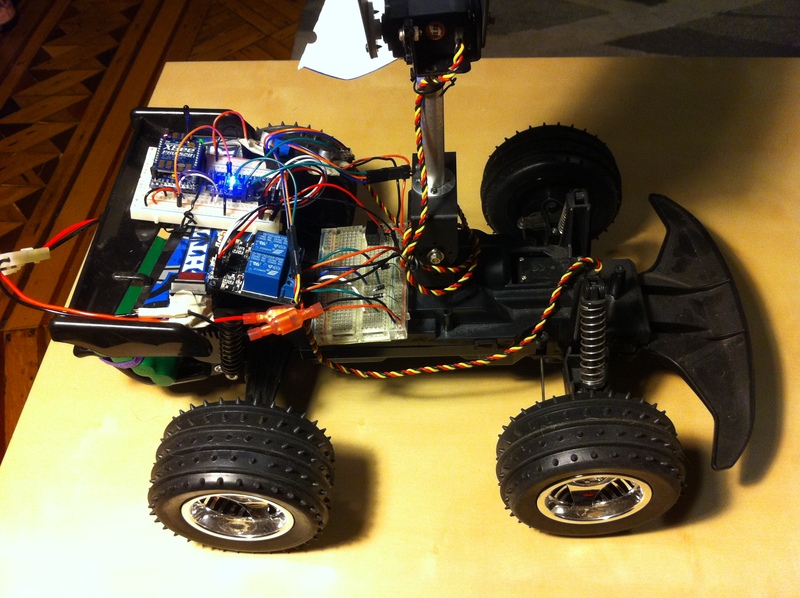 The Arduino is also controlling the motor on the back wheels of the car to move it forward and backward. 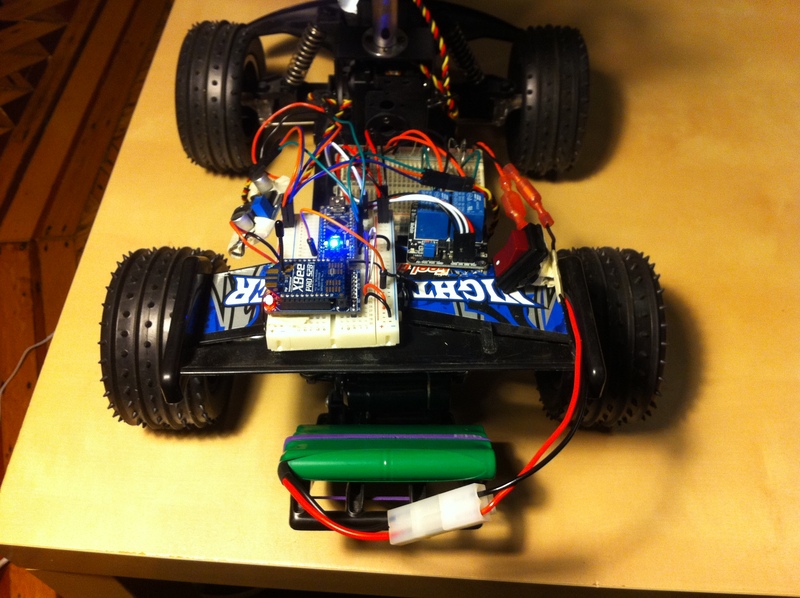 It is controlling that motor through an H-Bridge made from 2 relays and protected with the usual 4 flyback diodes. For this project I also used 2 buck step down converters to get 6V to the servos and 5V to the control logic and receiver. The rear motor still gets 9V directly. This allows everything in this case to be efficiently powered off of one 9V battery, even though the components needed various different voltages. 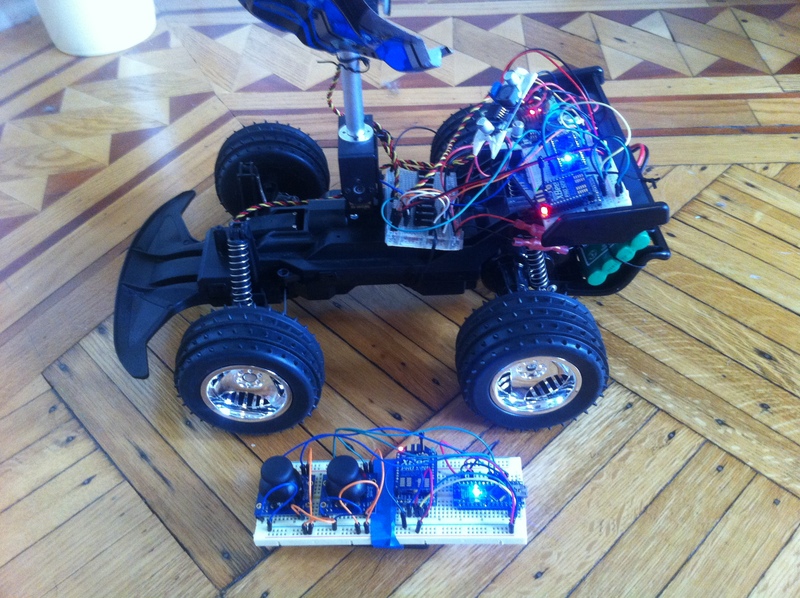 Using this setup, this custom remote with 2 joysticks can control the RC car and its attached robotic arm. Final soldered remote control w/ headers. 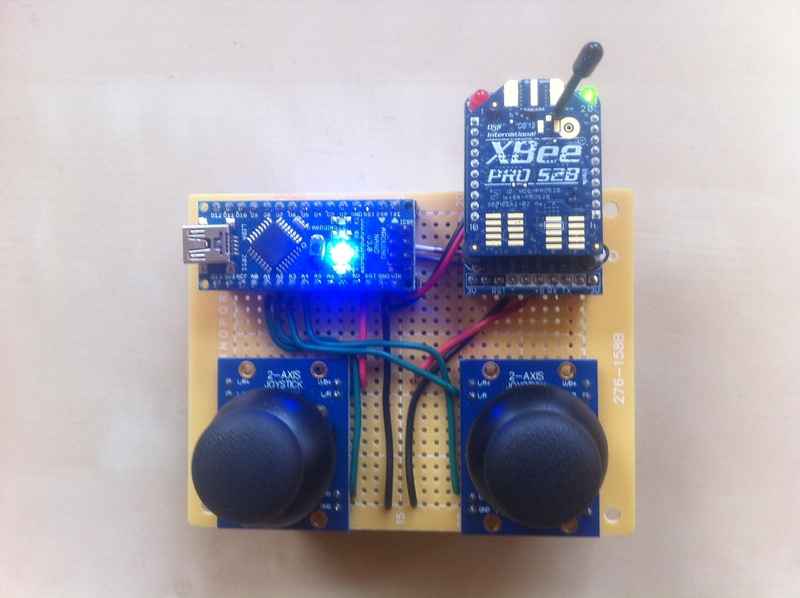 Still allows Arduino and XBee to be reused. Beautiful project ! Could you send me the codes for the remote and for the car ? I would really like to construct something similar. My relatives all the time say that I am wasting my time here at net, but I know I am getting knowledge all the time by reading such pleasant content. You don’t need to use the files as a library. If you have those files all in the same folder they will show up as tabs in the Arduino IDE and should compile fine when you compile the car.ino.